Cycloloma atriplicifolium (Spreng. ) J.M. Coult. Stems: Spreading to erect, much-branched basally, villous to tomentulose or glabrescent. Leaves: Cauline, alternate; petiole to .6 inch; blade oblanceolate, .8 to 3.2 inches long, .2 to .8 inch wide, base wedge-shaped, margins irregularly sinuate-dentate, tip acute to mucronate, without spine-like bristle at tip, surfaces tomentulose or glabrescent. Inflorescences: Spikes, terminal; bract 1, linear to elliptic, 1/8 to 2/5 inch. Flowers: Bisexual or pistillate; tepals 5, connate ca. half their lengths, lobes each strongly keeled and horizontally winged; petals 0; stamens 5; styles 0, stigmas 3. Fruits: Utricles surrounded by persistent calyx, at maturity forming a horizontal membranous, erose, circular wing; seeds black, lens-shaped. 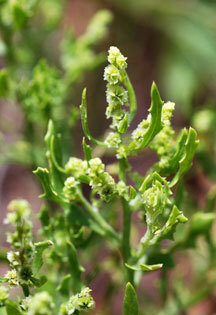 Comments: Cycloloma, circle and border, alluding to the fruits, and atriplicifolium, alluding to the resemblance of the leaves to the genus Atriplex.